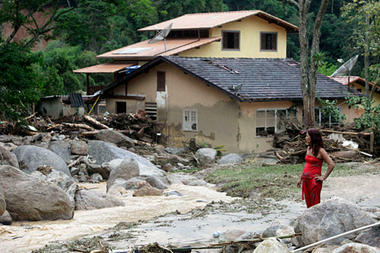 A resident looks at a destroyed house after a landslide in Teresopolis, Brazil, on Jan. 13. Rescue workers struggled on Thursday to reach areas cut off by floods and landslides that have killed at least 511 people in one of Brazil’s worst natural disasters in decades. Bruno Domingos/Reuters. With rain still falling in parts of Rio de Janeiro and the death toll from massive flooding topping 500, authorities and experts turned their attention to apportioning blame and deciding how to avoid repeats of what has become a familiar tale in Brazil. Local officials estimate the death toll at 511 so far, concentrated in four hillside cities north of Rio de Janeiro, after torrential rains caused rivers to jump their banks and hillsides to give way. While national and state authorities are pinning the blame on municipalities for allowing citizens to build in insecure areas, the federal government itself is coming under scrutiny for recently slashing its budget for handling natural disasters. Even though annual flooding is common around Rio, a proposed national center for disaster management never got off the drawing board and the federal budget for disaster prevention and preparation measures is down 18 percent in 2010, says Mr. Castello Branco. Last year the government spent just 40 percent of the cash allocated for disaster prevention and preparation, and more than half of that went to Bahia, a state that had no major disasters, because the minister in charge of disbursing funds was running for governor there, Castello Branco says in a telephone interview. The flooding that began in the past week is being described as the worst natural disaster in Brazilian history. Footage of the worst-hit areas looked like it came from a Hollywood disaster movie. One cameraman caught the remarkable scene of a housewife being hauled to safety through roaring river with just a rope around her waist. Another caught the joy of rescue workers discovering a baby alive after being buried in mud for 12 hours. However, those were rare positive moments. It was a rude awakening for Brazilian President Dilma Rousseff, who took office less than two weeks ago and stopped off in one of the cities, Nova Friburgo, for 45 minutes on Thursday. Ms. Rousseff promised the state of Rio de Janeiro more than $1 billion in aid by 2014 but played down the fact this was the third major disaster caused by flooding in the last three years in Brazil, and the second consecutive tragedy in Rio. Rousseff and Rio state governor Sergio Cabral put the problem down to decades of lax oversight by municipal authorities who allowed people – mostly poor people – to build houses on hillsides vulnerable to landslides. Mr. Cabral said 18,000 people lived in high risk areas in the city of Rio de Janeiro alone and said the city’s mayor would need to make the unpopular decision of removing them. “Building houses on high risk areas is the rule in Brazil, not the exception,” Rousseff added. “You have to get people away and into secure areas. The two fundamental issues are housing and land use” and that involves putting proper drainage and sewage systems in place. Experts, however, cautioned that such plans can take decades to carry out and said that politicians have failed to take such sensible steps to avoid repeated tragedy. Floods killed 133 people in the southern state of Santa Catarina in 2008 and left more than 200,000 people homeless in the impoverished Northeast in 2009. In 2010, floods killed 53 people when an entire neighborhood built on a hillside garbage dump gave way in Rio.